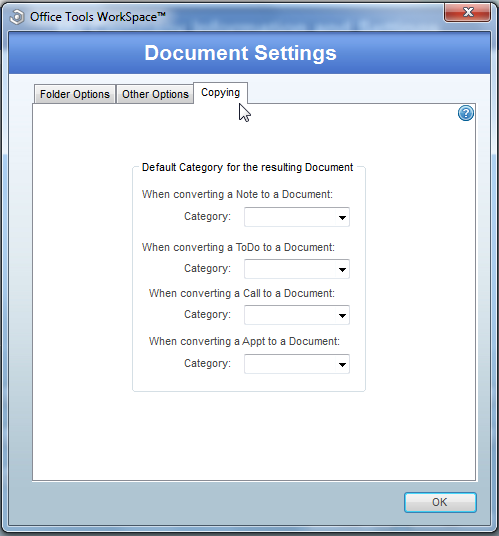 The Copying tab located in Setup>My Company Information & Settings>Documents controls the category that fills by default based on what type of task is being converted into a document. Within OfficeTools WorkSpace, there are Notes, To-Do’s, Calls, and Appointments, all of which can have pertinent contact information that you may want to turn into a PDF document attached to the given client. Each of the fields control the default category that will populate in when performing the aforementioned “Copy To” function. Please note that this is just a default option. Whether you choose to use this default or not, the category used can always be chosen when performing the “Copy To” function in any tab in WorkSpace by clicking on the following symbol.